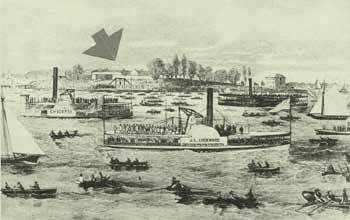 In July 1860, dozens of boats jockeyed for a prime spot off Bedloe’s (now Liberty) Island. The boats carried 10,000 New Yorkers heading to see not fireworks or another summer celebration but an execution. The doomed man was Albert W. Hicks, a 40-year-old sailor who confessed to the gruesome murders of the skipper and two mates aboard the schooner A.E. Johnson earlier that year. The Johnson was an oyster sloop, on its way from Spring Street to Virginia to procure a shipment of oysters. Days after departing, it was found floating 50 miles from New York without its crew, the cabin awash in blood and human hair. Authorities quickly deemed Hicks a suspect. When they picked him up for questioning in Rhode Island, he had the skipper’s watch. So he confessed: He said he’d been drugged and shanghaied onto the sloop, then to escape he killed the crew, dumped their bodies into the Atlantic, and left in a yawl to Staten Island, making off with a few hundred dollars. His trial captivated the city. After being convicted and sentenced to hang, he claimed he’d killed dozens of men at mining camps around the country. That July morning he met his fate, the thousands of spectators created “a motley and strange scene,” The New York Times reported. At 13 minutes past 11 a.m., Hicks was hanged, the last person to be put to death for piracy in New York.